“We see tremendous sense in the Memory of Nations: Yes/No exhibition, which is a project of the Post Bellum non-profit organisation. We must preserve the stories of the heroes and antiheroes of that time and hand them down to the coming generations. 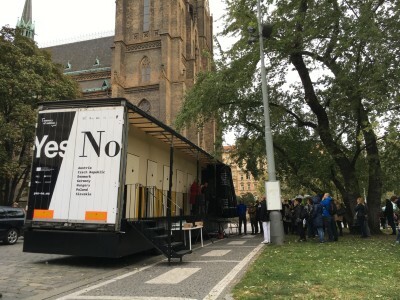 I believe that the attractive format of the exhibition and its placement on one of the most visited squares in Prague will ensure that it enjoys an audience of all generations,” says Aziz Jahić, marketing director at C.S.CARGO, which is a partner of the exhibition. The exhibition is unique in terms of both content and form. With an iron structure and wooden backdrops, the exhibition’s creators transformed the truck trailer into a courtyard leading to twelve apartments. When looking through the doors via built-in peepholes, viewers see and hear the individual stories. The exhibition was commenced in May in Slovakia and later travelled to Hungary, Austria, Poland and Denmark before making its penultimate stop in Germany. In Prague, the exhibition is part of the celebrations connected with the country’s centennial. Memory of Nations is the most expansive publicly accessible commemorative database in Europe, which the Post Bellum non-profit organisation is building and administrating in cooperation with the Institute for the Study of Totalitarian Regimes and Czech Radio.